Every year during Staff Appreciation Week at my kid’s school a group of parents join forces and each provide a Crock Pot full of soup to create a soup buffet lunch for the all staff that work in the school. 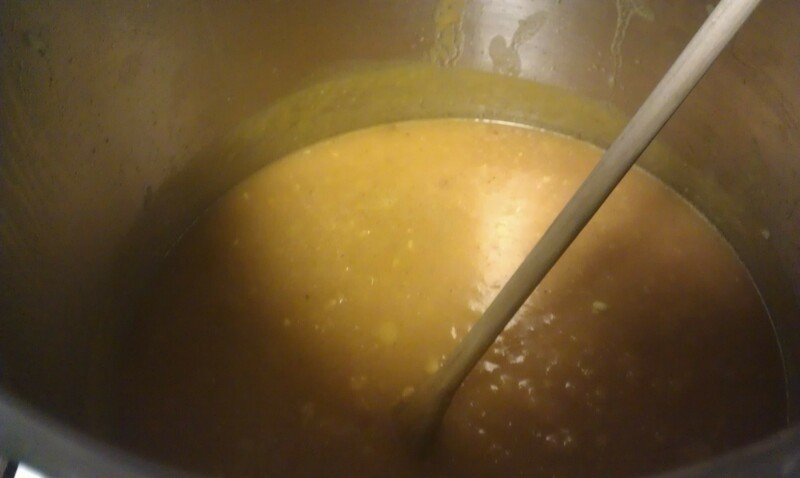 In previous years we had provided catered lunches but they weren’t as light as soup can be and with everyone making a different soup there was sure to be something for everyone to enjoy no matter diet preferences or allergy restrictions. Every year I like to try and make something different. The first year I made a Baked Potato Soup and last year I made a vegetarian Sweet Potato Corn Chowder and both of these I’ve been told were enjoyed by many. This year I went to a collection of soup recipes assembled over the years by dear friends of mine for inspiration and was struck by the recipe for this Pumpkin Curry Soup from my dear friend Shelley. Now I will admit to tweaking this recipe a bit by adding two additional spices, Turmeric and Cumin, that weren’t called for in the original ingredients list and their addition just enhanced the overall flavour profile. Starting top left: 6 cups prepared chicken stock, chopped onion and minced garlic, spice blend of curry powder, salt, coriander and red pepper flakes, pure pumpkin, and half and half cream. I didn’t have chicken bouillon cubes in the house as we buy a base that is paste rather than powdered called Better Than Bouillon. So because of this I went ahead and made the stock for my liquid component as instructed on the side of the jar. If you wanted to go vegetarian with this soup you would just need to substitute out the chicken for a veggie based stock. I also doubled the recipe so I could have a good amount in my Crockpot. While I did get the ingredients from Shelley the process was my own. Lol there were no instructions per se so I worked with it and followed what seemed most logical. I started with the butter in my stock pot. I can see how you could easily substitute olive or canola oil in this step to make it a bit lighter. When baking I tend to substitute oils and butter with some unsweetened apple sauce to cut down the fat content but this doesn’t translate to frying as I have found. If someone has a suggestion I’d love to hear your feedback. Once my butter was melted and starting to get that smell of browning I put the onions and garlic into the pot and walked away to let them soften. Again when it comes to something like softening onions and garlic I tend to have to find something else to do or I spend a lot of time stirring when in reality it just needs to be left alone to do it’s thing. Once I have softened onions and garlic I go ahead and add my spice blend to allow the spices to toast a bit. The spices made my kitchen smell really great. I love the smell of curry and when I smell it I am struck but how it makes me feel warm. I can’t fully describe it but when I smell it I just feel warmth spreading through my body starting with my belly. After I have given the onions, garlic and spices a chance to come together I stir in my chicken stock and let it come to a simmer. I gave it a few minutes to come together and absorb flavour from each other. Then I whisked in the pure pumpkin. Finally some Half and Half. The last thing I do is add my Half and Half Cream. I wondered if I could lighten it up by going with a low fat sour cream next time for this and may try it. The nice thing about soup is that you generally use crackers with it so the fact that is it on the thin side isn’t a bad thing unless you were going for a chowder. Finally into the Crockpot for the next day. I got about a 3/4 full 6 quart Crockpot with a double batch of this soup. I didn’t let the cream heat up too much when I added it as I knew that it would have 3 or so hours to warm and come together on low the next day. I haven’t gotten any feedback yet but when I tasted it before putting it into containers for transport the next morning it had all the notes I wanted from it and felt pretty proud about it. From my dear friend Shelley. 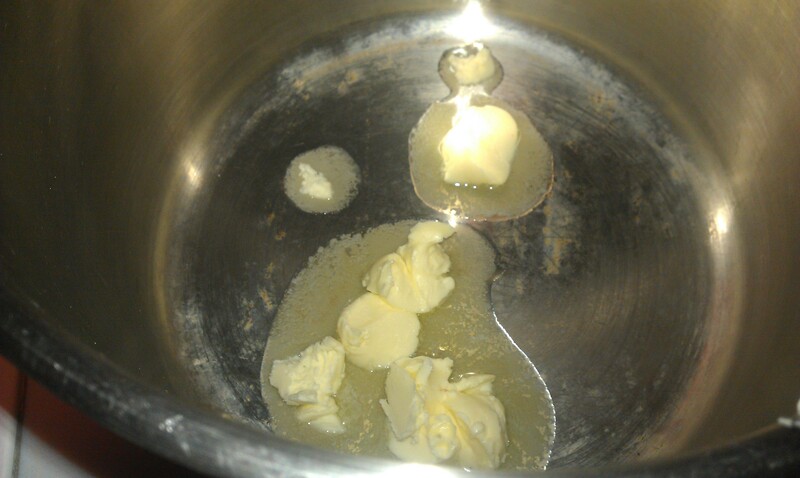 1) Melt butter in a stock pot. 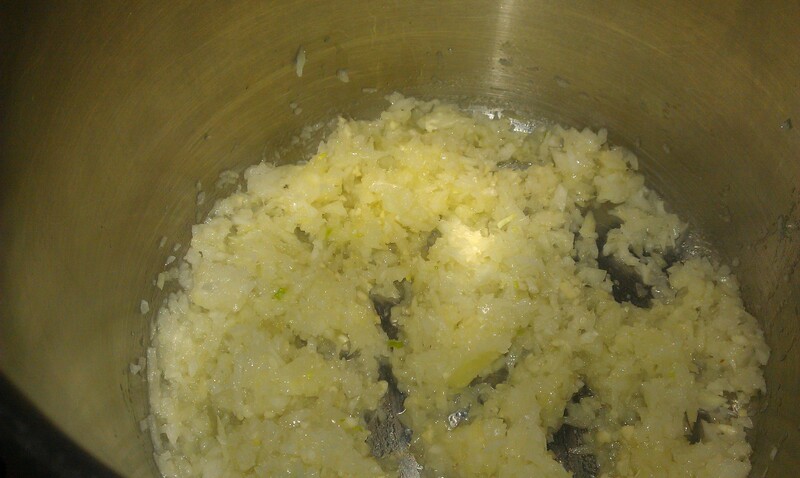 2) Add onions and garlic and allow to soften. 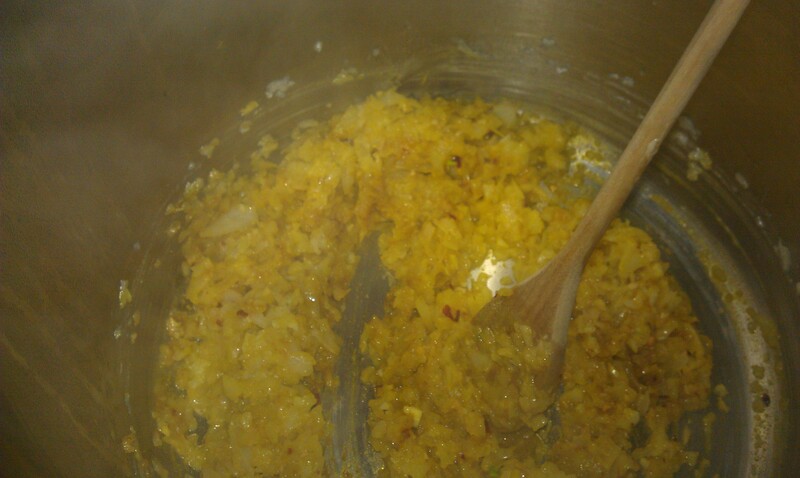 3) Once the onions are garlic are softened, add the spices and allow to toast for a couple of minutes. 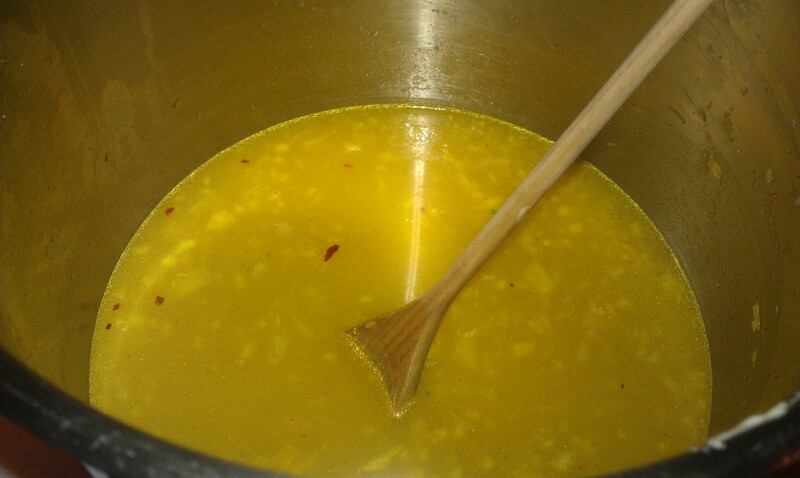 4) Add the chicken or vegetable stock. Allow to simmer for a few minutes. 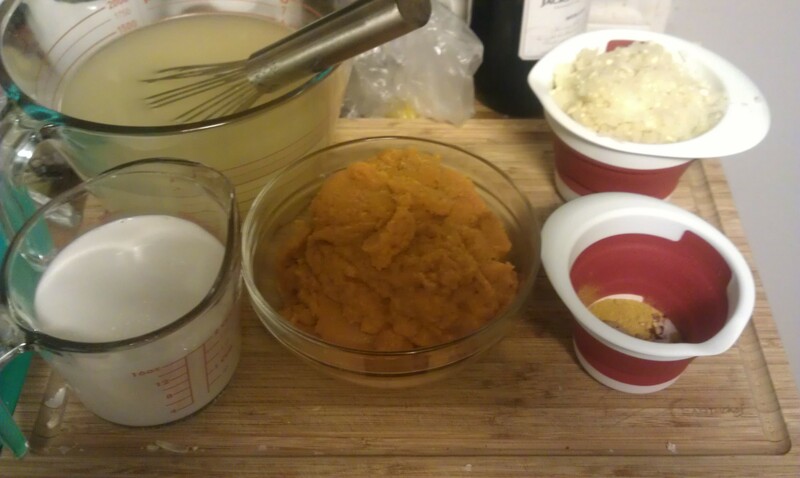 5) Whisk in the pumpkin. 6) Add the half and half cream. Allow to warm through (be careful it could burn) and serve with fresh chive garnish. 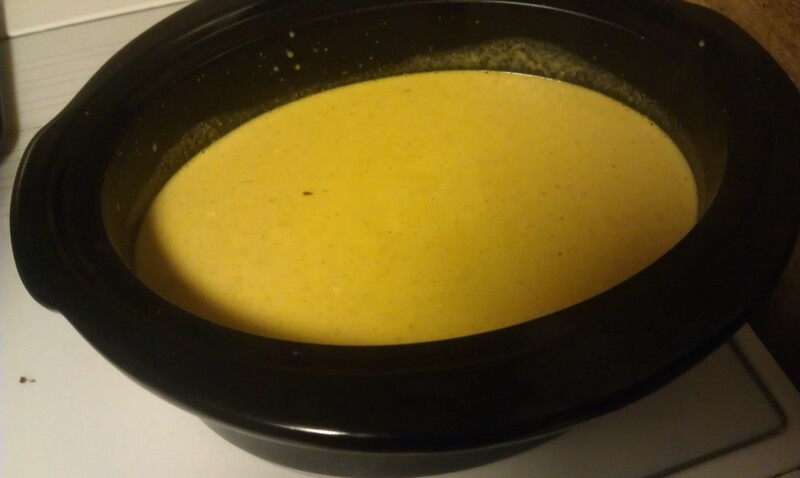 Posted on February 20, 2013 by Shirley Robert	• This entry was posted in Recipes and tagged chicken, chicken bouillon cubes, coriander, cumin, curry, dinner, food, garlic, half and half, onion, pumkin, red pepper flakes, soup, spice blend, staff appreciation week, turmeric, vegetarian. Bookmark the permalink. After the chicken stock and before the cream. Ooops I will make that change. Thanks for the catch!